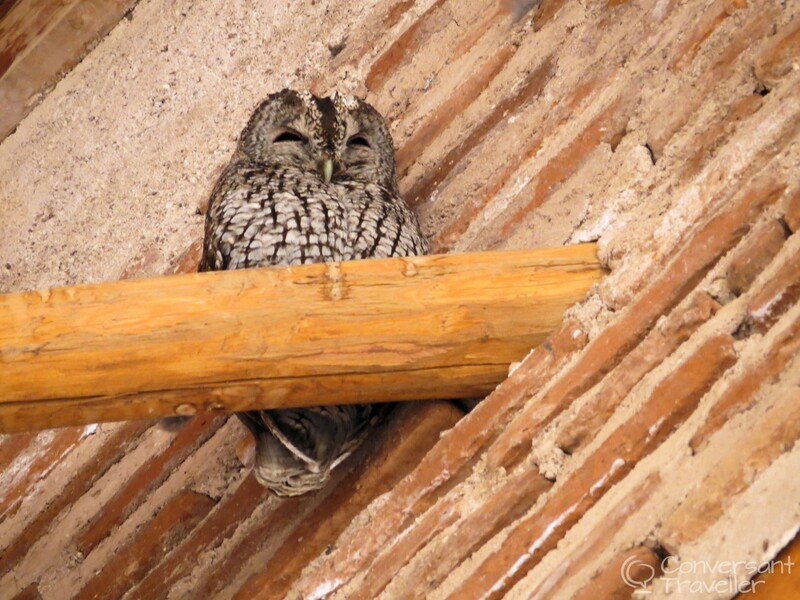 The night watchman eyed them warily from his lofty perch up in the crumbling tower. It wasn’t every day that visitors bothered to stop at Tin Mal Mosque, let alone come inside. He could tell they were tourists by the multiple cameras and pale skin, clearly unused to the warming caress of the local southern sun. Still deciding whether to pop down and make his presence known, he was saved the trouble by his counterpart, the day warden. So it was back to sleep again. After all it was still several hours before his shift would begin. The visitors in question were of course hubbie and I. We were on the first leg of our Atlas Mountains and Atlantic coast tour with Wild Morocco, and stepping inside one of only two mosques in the country (the other is in Casablanca) that allow non-Muslims to enter had been something I’d wanted to do for some while. Not for a religious or spiritual experience, but instead to gawp at the blooming brilliant architecture I knew was hidden from the world behind those walls. Original blog post from The Conversant Traveller by Heather Cole Images courtesy of The Conversant Traveller – all rights reserved. The Tin Mal Mosque on the Tizi n Test pass was even more spectacular than in my dreams! However I’m getting ahead of myself in all the excitement, and should really start at the beginning of the day to show what there is to see should you decide to try this stretch of the road trip. 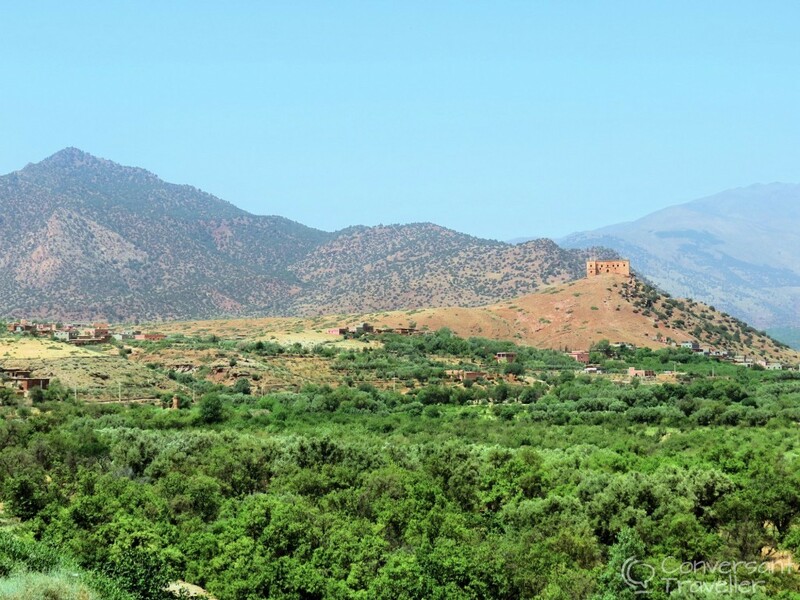 We headed out of Marrakech at 9 a.m. with our guide Salah, and journeyed south over rather nondescript scrub-land plains towards the foothills of the High Atlas Mountains. It was here that we’d been hot air ballooning a few years before, and I have to say it looks a whole look better from above! Stopping briefly in the dusty town of Asni, Salah procured the first of our delicious daily treats – fresh bananas and apricots (the latter he kindly washed in bottled mineral water) – to see us through until dinner. There’s no other reason to stop in the town (apart from the Saturday weekly market), but keep an eye out for the road going off to the left which heads up to Imlil and superb views of Mount Toubkal. 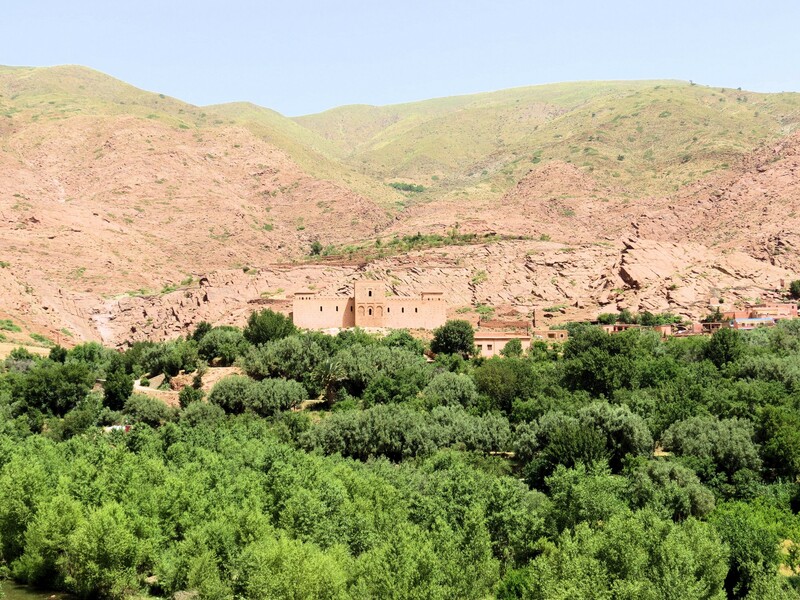 Imlil makes a great day trip out of Marrakech, or stay slightly longer if you fancy a bit of walking or unadulterated luxury at Kasbah Tamadot. We can recommend both. 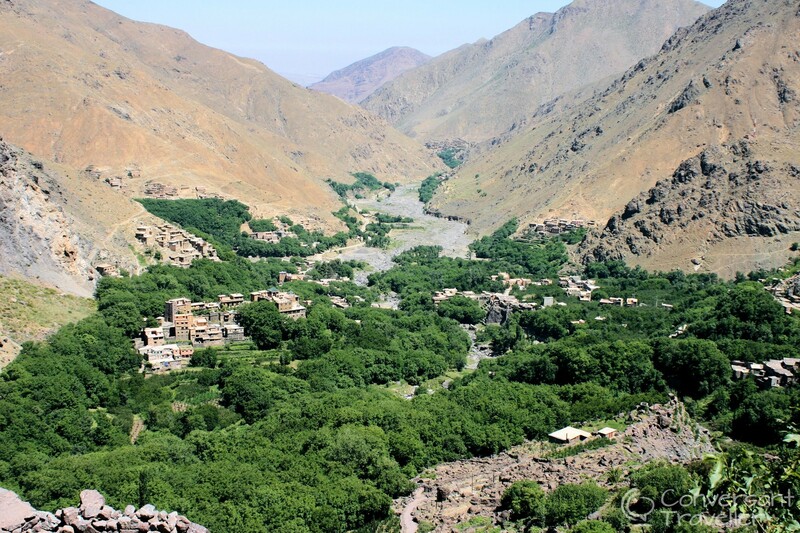 Next up is Ouirgane, a beautifully sleepy Berber village nestled at the foot of the High Atlas. Ouirgane is the sort of place you go to step off the treadmill of life and simply ‘be’ for a few days. 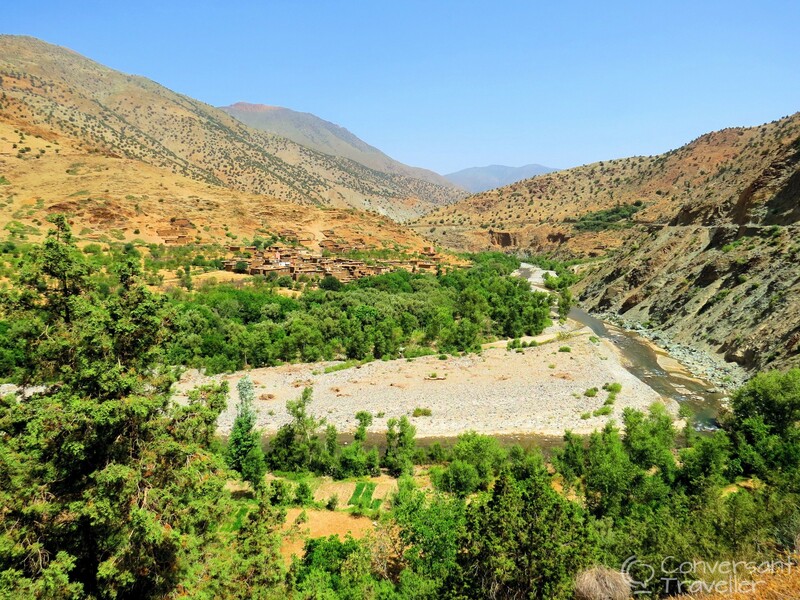 It struck me as one of the most peaceful places we’ve visited in Morocco, and with several decent guest houses in the valley it’s a great base for trekking, as well as gentle walks and chilling by the pool before bracing yourself once again to face the city. 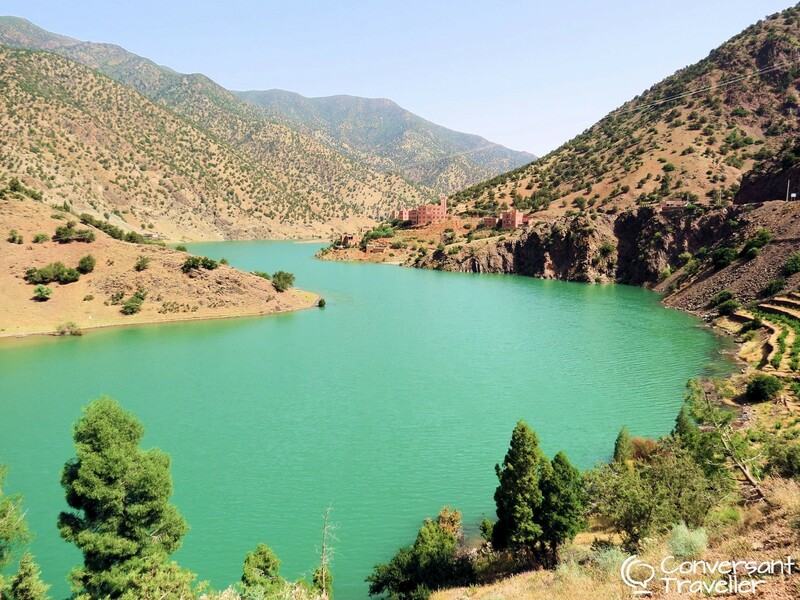 Popular in summer with the inhabitants of Marrakech who come here to cool down, the Ouirgane Reservoir was deserted during our visit, and very inviting in the hot sun! 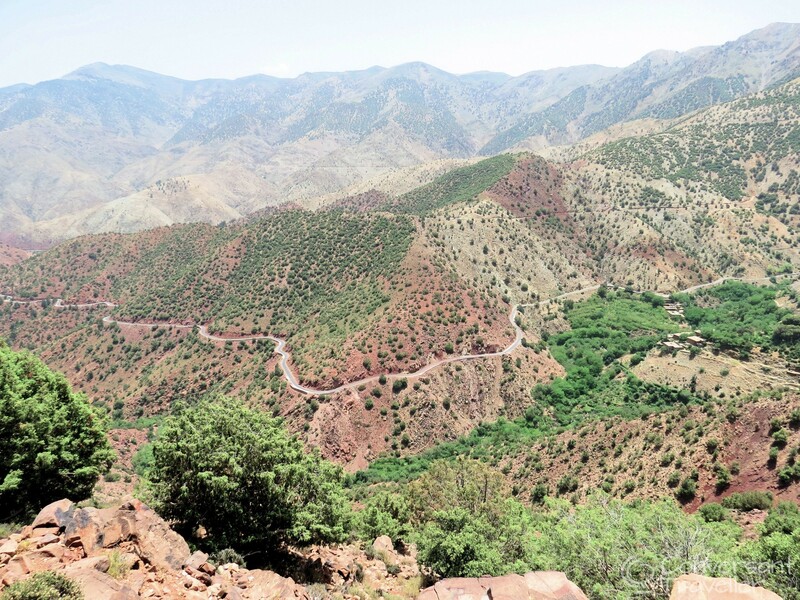 As the road winds slowly upwards through the Toubkal National Park, the mountains become steeper and the valleys greener. Around every corner a new vista awaits, whether it’s a lush oasis, a village clinging precariously to the hillside or a river snaking along, glinting in the midday sun. The next photo/banana/leg-stretch stop is in the Ijoukak valley for views of the Agadir n-Gouf kasbah. This was once the tribal stronghold of feudal chief Sultan C Goundafa, one of the three ‘Lords of the Atlas’ who tried to control this mountain area in the 19th Century. His tribe were constantly at war with the neighbouring Glaoui clan, who were based at one of our favourite haunts, the kasbah at Telouet. Like it’s counterparts all across the country, the kasbah is now crumbling and the only residents today are the storks which nest high up on the ramparts. Yet it retains a certain air of majesty, and just as it’s owners once did, the kasbah still manages to lord it over the surrounding Atlas Mountains with convincing ease. Now let’s get back to the star of the show, Tin Mal. Just 100 km from Marrakech (and about one and a half hours drive), the mosque was deceptively unassuming from the outside. Rather than towering supremely from a rocky vantage point (which I have to be honest is what I’d expected), Tin Mal sits quietly down in the valley, it’s outline barely visible above the tree line. It is perhaps this almost humble exterior which has kept away the tourist hordes, revealing it’s secrets only to those who are worthy. Whilst hubbie and I were no doubt unworthy in many ways, since we’d planned our entire trip around seeing Tin Mal we felt we’d earned our entry stripes. Constructed in the 12th Century Tin Mal (also known as Tinmel) was once an important political, military and religious stronghold of the Almohad empire, and the place where the dynasty was born. 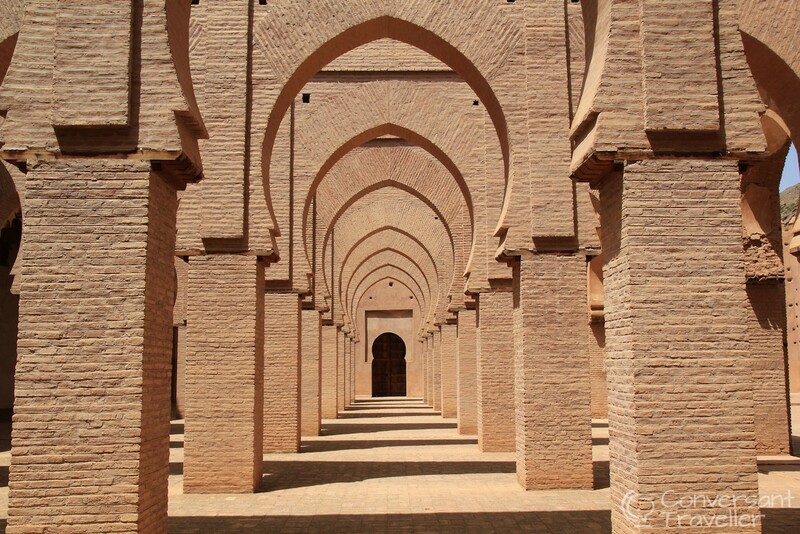 Stepping inside the austere walls is like being transported to another dimension, as the visitor is greeted by row upon row of symmetrical brick arches, all lined up with infinite precision, clearly built to impresses. Finally we reached the famous Tizi n Test, and I can’t help but compare it to it’s equally famous sister, the Tizi n Tichka which has been leading travellers south towards Ouarzazate and the desert since the 1930s. A big fan of the Tichka, I was surprised to find I enjoyed the Test drive (ha ha, see what I did there?) even more. It’s much more winding and the constant bends in the road necessitate a far slower journey, but what it lacked in speed it made up for in tranquillity. We encountered hardly another soul, and those we did pass were either cattle trucks, tractors or madmen who clearly took the road at one constant speed. FAST! Luckily Salah was an excellent driver, always looking ahead, but even so we had a couple of close shaves, all because the oncoming drivers had no regard whatsoever for other road users. I was thankful I wasn’t behind the wheel (a sentiment no doubt shared by the guys!). 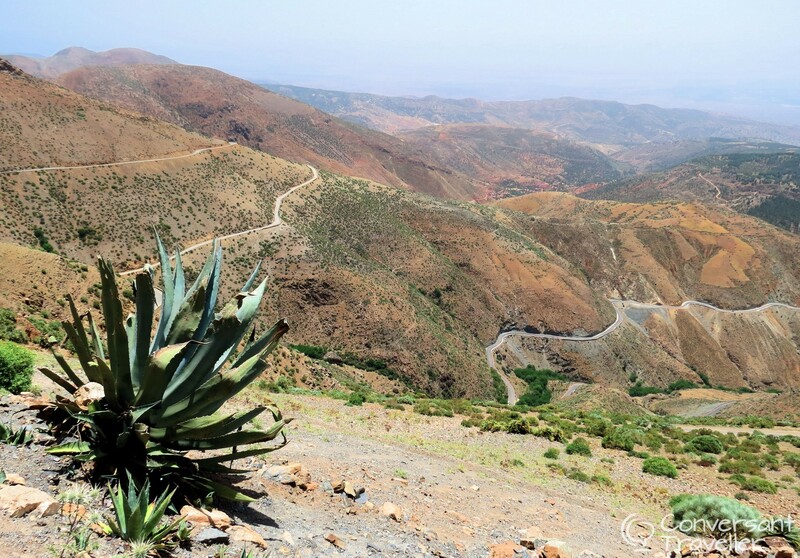 At 2100 metres the top of the Tizi n Test signals an end to the lush valleys and the start of a slow meandering route down to the plains, through arid and often barren landscapes, impressive in a different and more rocky way. We were both sad yet thankful when the mountainous road eventually flattened out and our journey continued across the flat Souss plains. 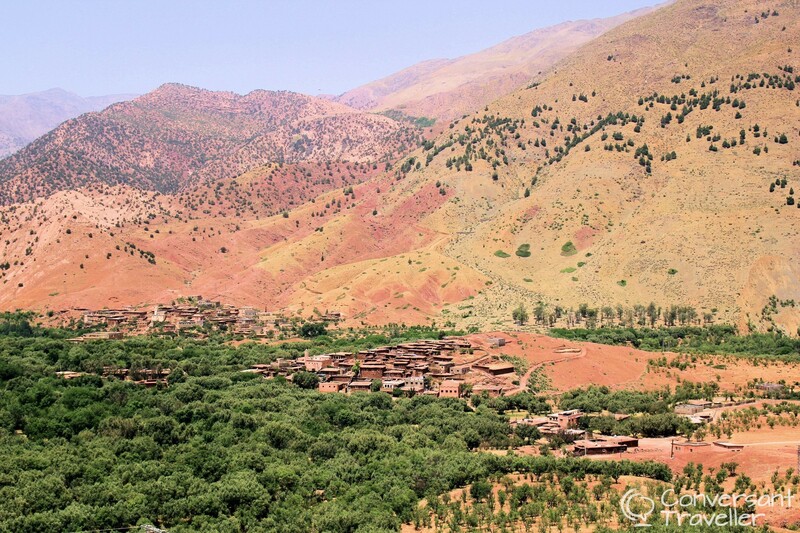 This is prime agricultural land, and the argan trees stretch as far as the eye can see. One of the most fertile areas in Morocco, the plains stretch all the way up to Agadir and across to Marrakech, an immense triangle of produce, much of which is exported overseas. However we weren’t there to ogle the oranges. 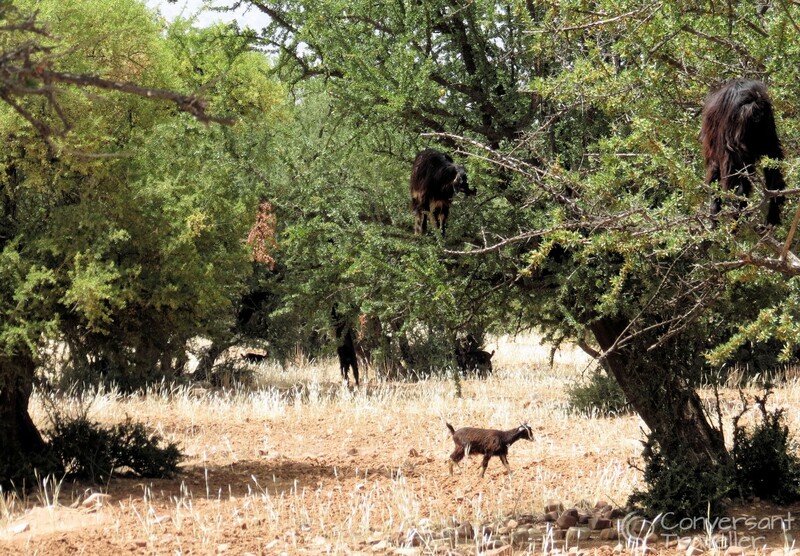 We were there because this is one of the best places to see goats in trees. It turns out it wasn’t a myth after all! The built- up areas dotted along the plains are fairly non-descript and industrial, some even appearing like ghost towns or long forgotten western film sets rising out of the scrub-land. One such place was Oulad Berhil. Ironically the name means ‘many children’, but we didn’t see a single one even though it was a weekend. Finally after almost seven hours on the road (including all the photo stops!) we arrived at our final destination for the day, Taroudant. 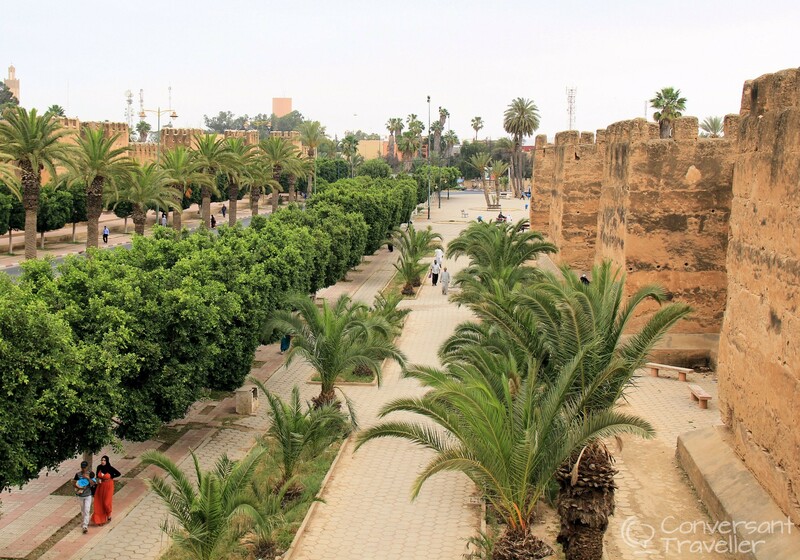 Often seen as something of a ‘grandmother’ to Marrakech, the walled city of Taroudant is calmer and almost completely devoid of other tourists. I still haven’t made up my mind whether this is a good thing or not. On the one hand it was interesting strolling the streets and witnessing everyday life like a local, but on the other we felt very conspicuous and were stared in neither a friendly nor unwelcoming fashion. There was no hassle either, which was either refreshing or disappointing. The jury is still out on that one. Overnight we stayed at Dar Al Hossoun. 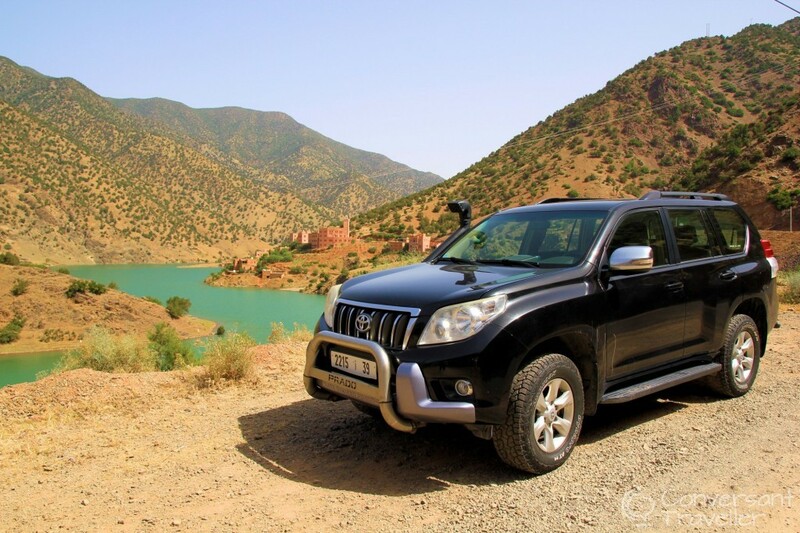 For the majority of the journey over the Tizi n Test from Marrakech, the best views are from the right hand side of the vehicle. Tip the guardian (the day one!) at Tin Mal around DH10 per person, and he’ll happily show you around and tell you (in passable English) some of it’s history. If the doors are closed when you arrive, just be patient, someone will have seen you arrive and the guardian will be along shortly. There is also a number you can call by the door. Tin Mal is closed to visitors on Fridays (prayer days). If you are driving yourself, be wary of larger vehicles (and speeding idiots!) on the hairpins. This is one of the most dangerous roads in Morocco, and not just because of the road itself! The night watchman at Tin Mal Mosque! We received a complimentary tour from Wild Morocco but all words, images and opinions are, as always, my own.